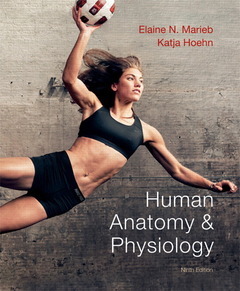 Human anatomy & physiology with masteringa&p® (9th ed ) MARIEB Elaine N., HOEHN Katja N.
Auteurs : MARIEB Elaine N., HOEHN Katja N.
With the Ninth Edition of the best-selling Human Anatomy & Physiology, trusted authors Elaine N. Marieb and Katja Hoehn have produced the most accessible, comprehensive, up-to-date and visually stunning anatomy & physiology textbook on the market. Marieb draws on her career as an A&P professor and her experience completing her nursing education Hoehn relies on her medical education and award-winning classroom instructiontogether, they explain anatomy & physiology concepts and processes in a meaningful and memorable way. All text and art features are now assignable in MasteringA&P®, providing additional opportunities to study. Twelve new Focus Figures help to build further upon the outstanding success of the previous edition's art program, and to aid in teaching additional tough topics. Twenty Focus Figures will be assignable through Interactive Tutorials in MasteringA&P. Clinical coverage has been increased throughout the text, as well. Every Homeostatic Imbalance section in the narrative is now assignable as Critical Thinking Questions in MasteringA&P. Chapters now conclude with an At the Clinic section, featuring 14 brand new Case Studiesall reviewed by an emergency room surgeon for accuracy and plausibility. Further practice with additional Case Studies, including Teaching Notes, now available in MasteringA&P, as well.